Background on #5 – I eat really fast. I don’t take breaks between bites, except to ask for a second helping. In general, I take “fresh from the oven” or “straight off the griddle” a little too seriously. Needless to say, I’m not the best dinner companion, unless you believe dinner companions should be seen and not heard – and even that’s questionable, because the visual representation of Rule 5 is not very attractive. I try to make up for it by feeding people well; I’d think that these highly adapted, quasi-Hawaiian, 100% vegan-unfriendly laulau farro packets would do the trick nicely. Laulau is yet another Hawaiian dish I am obsessed with despite never having tasted it off the Continental 48. One doesn’t really need a 10 hour flight to understand that the carnivorous combo of chicken, pork, and salted butterfish, wrapped in leaves and steamed until collapsing into perfection, is bound to satisfy. Fat is important for taste and texture, so chicken thighs and pork shoulder are best here; recall that this is Manhattan autumn and island bodies are soon to be irrelevant! 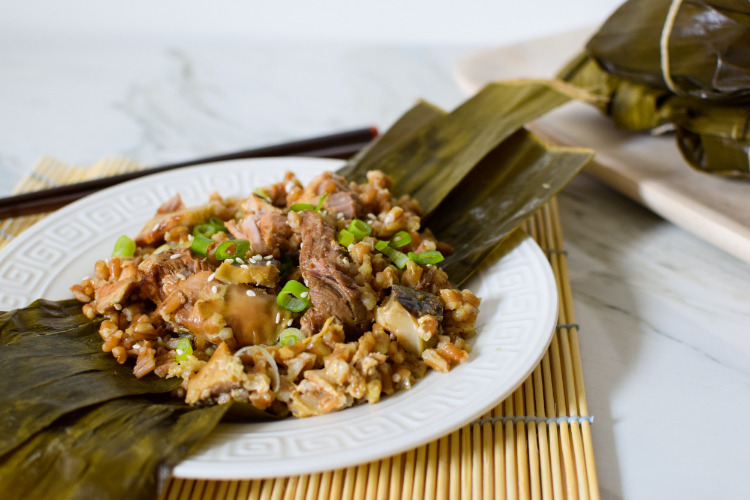 The salted butterfish adds an unmistakable and surprising note of brininess to the meats, sharp against the subtle fragrant backdrop of banana leaf. 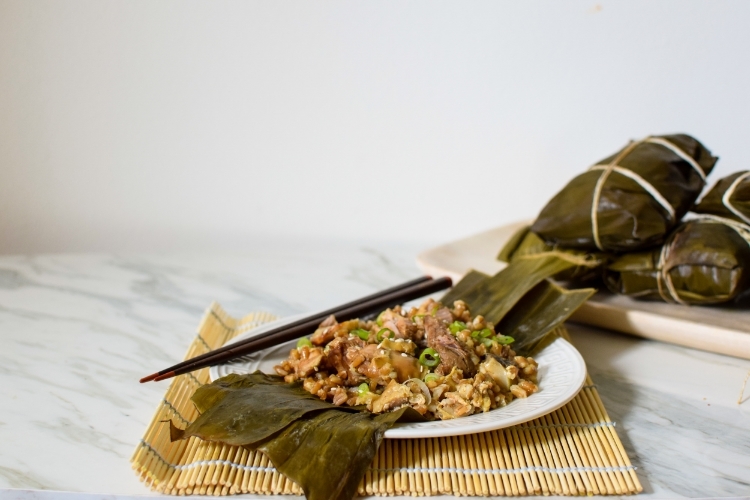 Traditionally, laulau is served over rice, but I took a cue from Chinese zongzi and added some farro straight into the steaming packets to fully absorb the luscious flavor blend. Most of the time, I try to tell a story through my cooking. Some dishes remind me of family or heritage or experiences. Others, like these laulau farro packets, are simply good straightforward meals. They’re my forward-looking recipes, the ones that will eventually create memories and carry their own weighty meaning. For now, I’ll think of this as the meal I actually lingered over and savored, a juicy present with surprisingly complex and distinct layers of aroma and taste. The night before: Soak the 1.5 cups of uncooked farro in water and baking soda solution. The baking soda is slightly alkaline and will give the farro a sticky yet firm texture - completely optional. Soak the banana leaves in warm water overnight as well to soften completely. Assembling the packets: Rinse the salt butterfish well. Drain the farro and layer as follows: banana leaf, farro, chicken, butterfish, pork, farro. Optionally, you can dip the chicken and pork pieces in dark soy sauce for color, but the butterfish can be pretty salty so be sparing. Do not overstuff! Roll up the banana leaves burrito-style, double-wrapping as needed (the banana leaves split easily), and secure with string. Don't tie too tightly, as the farro will expand as it cooks. Steam: Steam over low heat for 4 hours. Check tenderness with a toothpick at 3.5 hour mark. These freeze well; to reheat, simply steam for another 15 minutes or so. To make salt butterfish: Leave the skins on the butterfish fillets, make sure all bones are removed. Pack a container with coarse sea salt, and layer butterfish fillets over it. Cover completely with sea salt, and layer the butterfish as needed. It's important that the fillets are essentially completely buried! Leave in the refrigerator for 48 hours, covered. Remove and rinse; let dry in the fridge for 1 week. Finished salt butterfish will keep for months in the fridge.